Sea Buckthorn Berry is an incredibly nourishing and revitalizing oil. Hippophae rhamnoides, Origin - Russia. Cold pressed from the seed and berry. 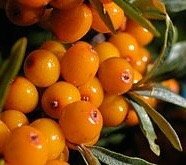 Sea Buckthorn Oil has become a popular ingredient in many skin-care lines. Used for centuries in Europe and Asia, Sea Buckthorn has exceptional skincare benefits. The berries of the sea buckthorn plant are rich in vitamins and nutrients, and the oil is high in phytosterol, Vitamin E, Beta-Carotene, Antioxidants, and Carotenoid--all key ingredients in nourishing, revitalizing, and restoring healthy skin. The oil is used for eczema, acne, dermatitis, burns, wounds, sun-damaged skin, irritated and dry skin and tissue regeneration. Sea Buckthorn oil is said to help combat wrinkles, dryness and other symptoms of malnourished or prematurely aging skin, and is a popular ingredient in many mature skin blends. In addition, several skin care lines add the oil to their products for sun protection, since the oil is said to provide natural UV protection. Sea Buckthorn oil is a thick, red/orange colored-oil with the consistency and viscosity of syrup. If used without diluting properly, the oil may temporarily color the skin. We recommend adding this to your skin care preparations at a 1-2% dilution. Note: This oil will solidify at low temperatures, and is best left at room temperature.